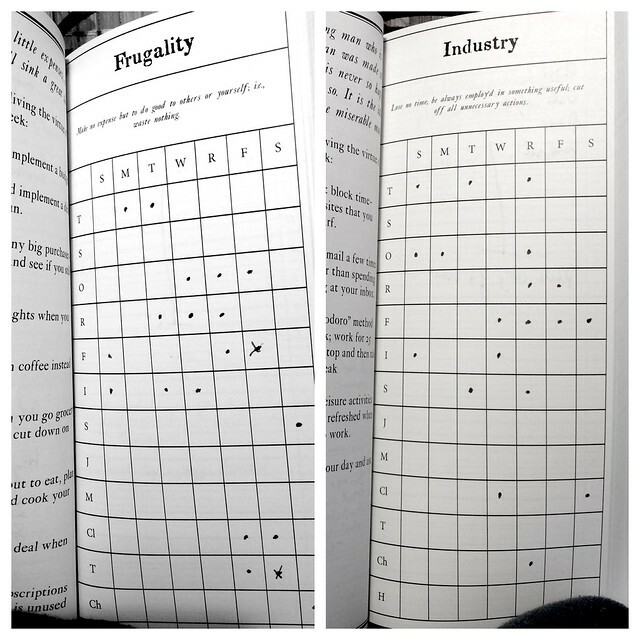 Grids for Frugality and Industry. Fitting that both I remember to post the previous forgotten one in my week of "be always employ'd" but also that these two should go together. The heart of Franklin's beliefs on the goodness of a person lies at the crossing of Frugality and Industry. An industrious and frugal person can and shall have a free life. "...For Industry pays Debts, while Despair encreaseth them, says Poor Richard. -- What though you have found no Treasure, nor has any rich Relation left you a Legacy, Diligence is the Mother of Good-luck, as Poor Richard says, and God gives all Things to Industry." Debt corrals freedom. You can't be your best person when you are beholden to others for all that you do. My week with Frugality was fine. I became much more aware of the frequency with which I spend money when I needn't - I am a fan of tacos on nights I get home late. I use take out food as a mean's to easier relaxation in an evening. A late night at work, a long gym session, bunch of errands or Bunny Rope tasks and the last thing I want to do is cook for an hour and immediately go to bed. I'm stuck on the utility of that use case. Ultimately, it doesn't really affect my budgeting. Alyska and I got our spending pretty well in order last year as we reviewed our budgets to better accommodate her health insurance needs. We don't spend especially frivolously - between us we have the mortgage, my car loan (2), and maybe a few hundred dollars on credit cards that we pay off monthly (3). Make the Wealth small, and the Wants great. I've never been one to work constantly - I have a very well understood threshold to overwork - and am generally good at relaxing when stressed. This week helped me recognize how much being engaged in a task can make that task refreshing. I spend much time at work distracted lately. I am in a meeting not being in the meeting but either working on other things or at least thinking about them. And that's not good for my productivity, utility, or sanity. Take the task before you and do it well, not while thinking about everything else. My week on Industry helped me realize the virtue of doing things besides working too. Bunny Rope doesn't feel like work when I'm doing it. Though it is a business and has responsibilities, I find many of the components of it refreshing. In the previous week while doing the last set of things for MTKF, I realized how satisfying it can be. I like the handwork and the solitude it provides. Scheduling a small set of tasks for it in the evening - like breaking a bunch of lengths, or tasseling hundreds of feet - is becoming fun. Like I'd almost rather do that on a Friday night. Further, exercise keeps me engaged. Getting my body moving and my mind away from work makes managing all the things that much easier. Writing that it feels like a No Brainer. Research abounds about the mental benefits of exercise (4) but I feel like I finally noticed how that contributes to focus on tasks. The question I am asking myself now that I'm half way through this phase of the project: Am I a better person for it? When I am sticking to the virtues, yes. I feel happier, less stressed, more in control, and better engaged in all the things I do. When I am not sticking to the virtues, no. And the delta between the two is growing larger. That is, when everything is off the rails, I feel crappy but it isn't much different than it used to be. But, when I am sticking to the virtues, I feel happier than before. And that's certainly interesting (5).